The biggest news for S&P 500 (Index: SPX) investors in the final week of January 2019 was the Fed's announcement that it would pause both its series of interest rate hikes and its quantitative tightening program aimed at reducing its holdings of U.S. Treasuries and Mortgage-Backed Securities (MBS) on its balance sheet. Investors responded positively to the Fed's official capitulation in the face of market reality, boosting stock prices up to the top of the range indicated by the redzone forecast in our alternative futures spaghetti forecast chart, which assumes that investors are maintaining their forward-looking focus on the current quarter of 2019-Q1. Should stock prices break above their current level, it would indicate that investors are shifting at least part of their forward-looking attention toward 2019-Q2, which is a real possibility since the expectations for dividends to be paid out in this more distant future quarter rose from $14.65 per share to $14.75 per share during the past week. The danger for investors continues to lie in what is expected to happen after 2019-Q2, as the rate of dividend growth appears set to considerably slow. 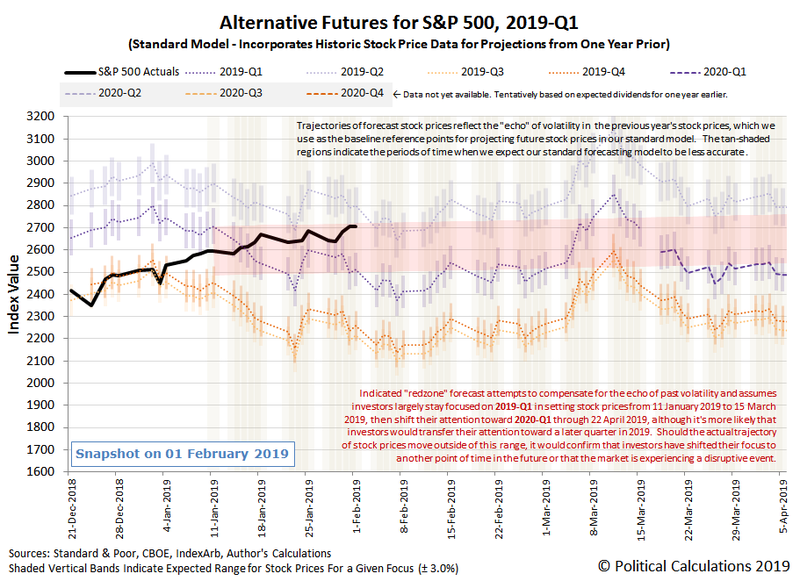 If and when investors turn their attention to 2019-Q3 or 2019-Q4, the likely impact to stock prices will be to drop considerably. Just like what happened in December 2018. Here are the major headlines that affected the outlook of investors during the final week of January 2019.